David Sedaris returns to his deliriously twisted domain: hilarious childhood dramas infused with melancholy; the gulf of misunderstanding that exists between people of different nations or members of the same family; and the poignant divide between one's best hopes and most common deeds. The family characters his readers love are all here, as well as the unique terrain they inhabit, strewn with comic landmines. 'The Rooster' is back, and getting married in the funniest wedding ever described. David attends a slumber party and gets the upper hand in a unique version of strip poker. 'Rubber or plastic?' The strangest questions can tear people apart. A skinny guy from Spain, wearing a bishop's hat and accompanied by six to eight men, invades your house and pretends to kick you. Is this any way to spend Christmas? With this new book, Sedaris's prose reaches breathtaking new heights and marks off a territory that is unmistakably his own. Read it and weep tears of humane laughter. The word “hilarious” in the above summary combined with my previous knowledge of David Sedaris led me to believe that this book would be very funny. Perhaps I just don’t understand Sedaris’ style of humor, but while I was often somewhat amused, I found very little of this book “hilarious,” which is odd since I’ve read reviews of this book saying it is quite funny. But for me, many of the stories were interesting, but not at all laugh-out-loud funny. In fact, most often they were just plain disturbing, and many also didn’t seem believable. Maybe some of the problem is that I read this as my first Sedaris book instead of Me Think Pretty One Day or When You Are Engulfed in Flames, but I don’t know. Again, however, I’m not saying that the stories weren’t interesting. They were. 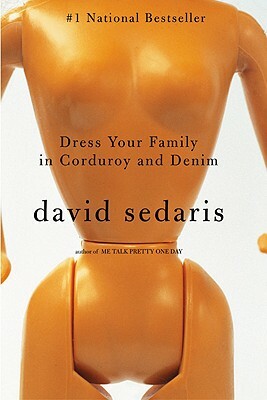 Sedaris is a great storyteller, and I enjoyed hearing about his siblings and getting to compare how they were as kids and adults. In fact, stories about the siblings were considerably more interesting to read about than the stories just about Sedaris, who, quite frankly, is a bit of an obnoxious douchebag. Sedaris jumps around in time a lot in this book, which both makes it interesting and kind of confusing – there are stories where he appears to be in his 20s, and others where he’s in his 40s, but it was hard for me to develop a timeline of when things happened once he got beyond stories about his childhood, so many of the stories ended up blending together. Overall, this was the kind of book that I would recommend not reading all at once, and instead reading one or two stories at a time over a few weeks. I think I would have liked it more had I done that, when instead I got sick of it about 4/5 of the way through and stopped reading (and then my Kindle loan from the library expired, and it doesn’t seem worth it to renew). I’m not yet ready to write off Sedaris altogether, but I don’t know if I’ll ever finish this particular book. My daughter sits and reads his books and roars with laughter....I have tried a couple, and I just don't get it I guess...not my kind of humor. Great review, and I totally understand. Oh, I think he's a treat to listen to--far more than actually reading him in a book is. Isn't this the book that contains "6 to 8 Black Men" on it? That's one of my favorite Sedaris stories ever. Also possibly one of my favorite Christmas stories ever. I would also agree that his stories/essays are best when not listened to in a long chunk of time. Still, he's definitely not for everybody, so don't feel like you're the only person who's missing out on his humor. Thanks for the recommendation -- I'll try audiobook for my next Sedaris. I don't recall "6 to 8 Black Men," but it may still have been in this one. I love David Sedaris' humor!!! I haven't read a Sedaris book yet, I've wanted to read Me Talk Pretty One Day for awhile, I wonder what it is like compared to this. I don't like the idea that he jumps around a lot with his time line. It would make things a little to confusing for me. Thanks for the great review! I know people who think he's a hoot, but I've always found him a bit lacking --amusing, at best. Maybe it's because I know so many funny people? Hi! You know, I didn't like this book either and I was disappointed because I thought Naked & Holidays on Ice were both hilarious. But after those two, Sedaris pretty much lost his appeal to me. I would definitely check out those other two titles if you want to give him another try. ...I'm glad I'm not alone in thinking IT was just not there in this particular book. Thanks for a great review! I love the title of it and would have gone for it but now I am not so sure... i might start with one of the ones recommended by Estelle above instead.